The Hotshots are wound all the way up and by the looks of things as Ellah, Butterphly and JJ were reaching every detailed level of their boiling points. It was interesting to see in all the hubbub and mayhem that it wasn't, as most had predicted, Tayo who lost control but the very people who saw it in him. Projecting much? In any case Ellah and Butterphly tried their best to hide it but the poor lasses slowly but surely became ticking time bombs during the course of the eventful and ex-rated evening. They were not taking kindly to the new ex-housemates muscling in on their territory, as Butterphly pointed out in her diary session. The once shy girl - who was struggling to come out of her shell – visibly felt the change was too sudden and most unwelcome. Displaced from their living area the three snuck out for some much needed fresh air in order to vent out their frustrations. What did come out it was that they all felt thwarted, belittled and shoved aside. Butterphly was livid at an earlier incident where Miss P and Leonel straddled her against her will. For a person like Butterphly this was unacceptable even though she did little to stand up for herself while they had their lewd way with her. They also shared their common loathing of Vimbai with unmatched passion. The ex-housemate from the Big Brother Amplified season not only offended her country-mates by mocking Zimbabweans but also made it her life's goal to break Ellah down with her every cheap shot at her. Ellah was told – in not so many words – that she wasn't the prettiest, that she was talentless and that putting herself on sale. 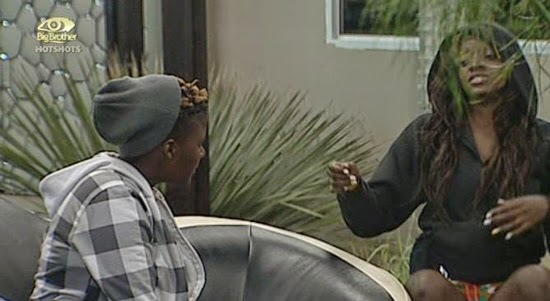 While Vimbai admitted in her diary session that it was in the name of fun it worked on the Ugandan's last nerve. Leonel had succeeded in sparking a series of little fires in the house but JJ was onto him. As a matter of fact, he was onto all of them. He wouldn't let it get to him – except he was. The trio and the rest were being stripped to the bare bone. Would they survive a whole week? Hahahahaha!!!!!! Loving evey bit of it biggie!! Couldn't sleep early last night cos I cudnt afford to miss any action. Bring it on!